Not so long ago, solar power was seen as a luxury item. To get the benefits, you had to own a roof, or enough space on your property for an array of solar panels. For apartment dwellers and owners of homes with pitched roofs or tree shade, electrical power from the sun was out of reach. Enter the Community Solar solution, which combines the concept of crowdsourcing with remote solar power generation. The Clean Energy Program of New Jersey Board of Public Utilities (BPU) is introducing a pilot program to give all residents a way to reduce their utility bills by investing in the shared output of communal solar arrays. These arrays can be built on any available space, such as industrial rooftops and parking lots. You don’t have to live near the solar array to enjoy its benefits, as long as you are on the same electric utility company’s grid. The power these community solar installations generate goes straight into that grid. Residents can then buy a subscription to the project, and share in the discounts when they get their power bill. At a presentation to the recent NJ Planning Conference in New Brunswick, Ariane Benrey of the BPU’s Office of Clean Energy described the typical community solar installation as a way for everyone to participate in shifting New Jersey away from fossil fuels to renewable energy, while saving on their own electrical bills. 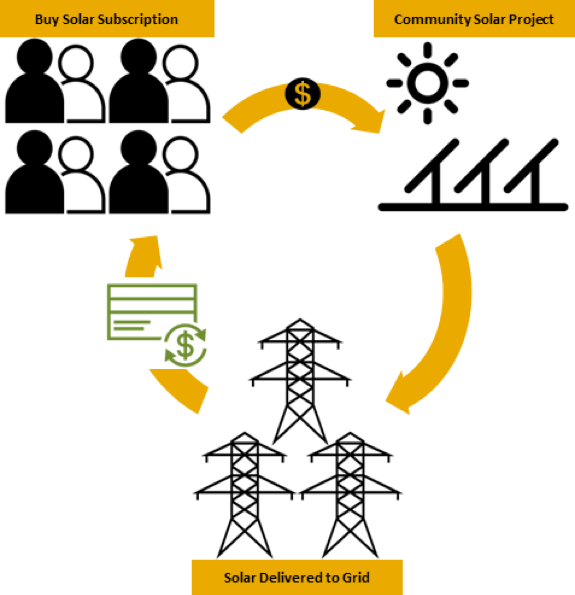 The three key roles to making a community solar project, Benrey explained, form a virtuous circle between site host, system owner/operator, and subscriber, as represented in this BPU diagram. Sixteen other states already have community programs underway, and three more are in development. Even densely populated New York City is implementing community solar -- despite the fact that NYC doesn’t have nearly as much available land as New Jersey. “We used to refer to NJ as the Saudi Arabia of flat roofs and the Abu Dhabi of parking lots because of all the great space available,” said fellow panelist Ron Reisman, formerly with the NJ BPU and now a “Solar Ombudsman” for the City University of New York, which leads the NYC Solar Partnership. Reisman believes community solar could remove the barriers to wide-scale solar adoption in NY. His group is working with community organizations to generate interest in solar, and then to use their combined purchasing power as an incentive to attract solar developers to build in that neighborhood. CUNY built an online “gateway” (https://sharedsolarnyc.org/) through which people and groups who want to create solar partnerships can find each other. As an example of a potentially significant solar partnership, Reisman described the NYC Housing Authority’s program to bring the benefits of community solar to its residents - a daunting ambition, but if successful, one that could simultaneously provide low cost power plus job training and opportunities. In New Jersey, the community solar program was jump-started by the May 2018 NJ Clean Energy Act, which gave the BPU 210 days to come up with a viable plan. On January 17, the Board of the BPU unanimously approved a three-year pilot program for the state. The plan will be official once it is published in the NJ Register, and then participants will be invited to apply. Once approved, each project is expected to be up and running within one year. The BPU is limiting the size of pilot projects to 5MW (which take up approximately 20-25 acres of space to build) and between 10 to 250 subscribers per 1MW installed capacity. Preference will be given to projects located on brownfields, landfills, areas of historic fill, and impervious surfaces. Benrey affirmed the BPU’s commitment to protect New Jersey’s open and preserved farmland and green spaces. Community solar is coming to New Jersey, and its advocates are about to embark on a widespread education campaign to persuade people that the solar power option no longer has to come at sky-high prices. Green Infrastructure is coming of age, and it’s time to demystify it.